Last edited by RePhil; 11-10-2018 at 02:58 PM. The developer must be a moron because there was an error! System.UnauthorizedAccessException: Access to the path 'C:\Program Files\Eagle Dynamics\DCS World\Mods\terrains\Caucasus\Kneeboard_orig' is denied. Did running in Admin mode fixed your problem? I got "Chuck's A-10 Guilde, to work in VR!!! I have increased my monitors size from 3840x1080 to 4820x1080 by adding a 3rd screen to my right. However, in the Kneeboard setting, DCS resolution, it still has the width as 3820 even though I have changed the DCS resolution in the game. Any thoughts on how to increase the kneeboard settings so the KB will appear on my 3rd screen (starting at 3841)? Trackir4 using the latest Trackir 5 software, Win10 Pro [Creator Update] updated from Win7Pro Pro 64Bit, Intel(R) Core™ i5-2500 3.30 GHz 6M Intel Smart Cache LGA115 , GigaByte GA-Z68XP-UD4 Intel Z68 Chipset DDR3 16GB Ram, GTX MSI Gaming 1060 [6 GB] Video Card, Main Monitor 1 on left 1920x1080 Touchscreen Monitor 2 on right 1920x1080 . Kewl, what did you do to get it to work? Does the Kneeboard builder support multi-monitor? I can't seem to get it to work. I recently moved DCS to a separate drive from my Windows C drive and now the Kneeboard builder won't work. When I click save and re-open the Preferences window, the install directory will be blank. For one thing, KBB is pointing to the OpenBeta installation, while you have selected the 'DCS World Install Directory' parameter 'Standard', which should be 'OpenBeta'. 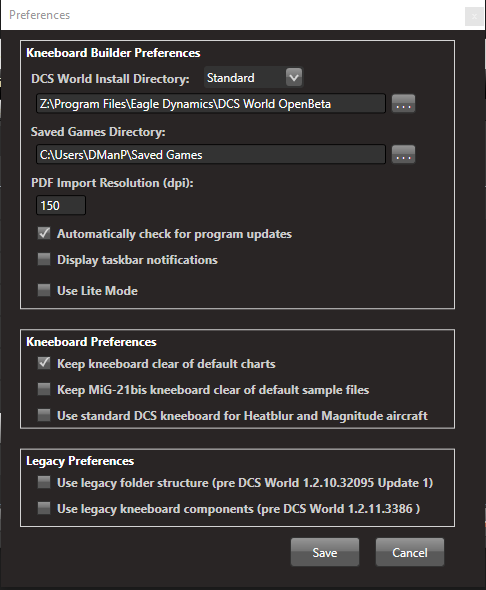 First off, in KBB Preferences you have selected 'E:\Program Files\Eagle Dynamics' and not 'E:\Program Files\Eagle Dynamics\DCS World OpenBeta'. I see that your '\Users' folder is on 'C:', while your settings shows '\Program Files' on 'E:'. Now, I'm not saying that such and installation is impossible --I've done some wild things on Windows installations back in the day as well--, but I suspect that you might have originally installed into 'C:\Program Files\Eagle Dynamics\DCS World OpenBeta' and later moved your installation to the 'E:' drive. With regards to moving the DCS installation folder, principally it is possible to do this and have it work without issue. I've done it myself. But there is an easy and simple way to do it, and a lot of other ways, which can be... problematic. 1. Move your 'DCS World[ OpenBeta]' folder to it's new location on another disk (moving to a new location on the same disk makes no sense an will give you no advantage). 2. Create a Directory Symbolic Link --NOT A WINDOWS SHORT CUT! !-- in 'C:\Program Files\Eagle Dynamics' pointing to 'DCS World[ OpenBeta]' in its new location. A: Open a Command Prompt Window with Administrator privileges in 'C:\Program Files\Eagle Dynamics', or open it elsewhere and navigate to here. B: Type 'mklink /D "DCS World[ OpenBeta]" "E:\Some Folder Name\DCS World[ OpenBeta]"' and press <Enter>, where '[ OpenBeta]' is optional depending on the DCS version, and all apostrophes (') are to be left off, as they are only for illustrative purposes only, but all quotes (") must be included. Last edited by Captain Orso; 11-27-2018 at 10:45 AM. Did you update your Kneeboard profile for the aircraft in question and save it again?